Saturday, Sept. 5th until Sept. 30th – Peninsula Gallery will exhibit Coastal Landscapes of SW England by Amanda Hoskins. Location is 520 E. Savannah Rd. Lewes. Visit the website above mentioned. Monday, August 31st – Movie at Dagsworthy Beach will be “Wall.e,” at 8:30 (dusk). Please check the Lifeguarding stand on Dagsworthy Beach for information in case of bad weather. Thursday, Sept. 3rd – 7 p.m. Terrance Simien & The Zydeco Experience. Friday, Sept. 4th – 7 – 9 p.m. – The Washington National Opera’s Domingo – Cafritz Young Artist Program. Overseen by Placido Domingo, this program is unique in guiding young singers, coaches, accompanists, conductors and stage directors on the verge of international careers. It will be an evening of opera as performed by future international opera stars. Saturday, September 5th – 10 – 11 a.m. Family Stages presents Cinderella. At 7 – 9 p.m. Choral Arts Society of Washington and Laser Night Show. This society is under the leadership of its founder and artistic director, Norman Scribner; one of the major choral organizations in the U.S. It is in its 44th season. Composed of 190 professional-caliber volunteers who have sung with leading symphony orchestras and under the world’s most distinguished conductors. As the summer season comes to an end, remember that September, October, November and December are great months, here at my beaches with restaurants open, plenty of parking, shopping, and beautiful, free sunrises and sunsets. Fifer Orchards opened this local market in 2007. Around my beaches we are so lucky that we are able to buy so much fresh produce during the summer months into the fall. This market is located on 2700 Coastal Highway or Rt. 1 in Dewey Beach, or the cross street would be Cullent St. The tel. is 302-227-8680. You cannot miss it whether you are traveling north or south. But, let me tell you, this is not a new market sprouting in my beaches. Fifer Orchards are full of tradition and since 1919 they have been in existence. Charles F. Fifer was a Virginia farmer that fell in love with the moderate climate and hearty soil of the region. He bought several farms and originally he was growing apples, peaches, pears and grapes. They were then shipped to different areas from the Wyoming, Delaware train station. Today, it is a very modern operation that owns 2,500 acres, growing all kinds of produce. Their Country Store is located on 1919 Allabands Mill Rd., Wyoming, DE 19934. Tel. 302-697-2141. Website is www.fiferorchards.com. Please check their website because they have events that go on all the time. You can pick your own, have birthday parties, group tours, school tours, you name it. You can even get a virtual tour of the farm on your computer. 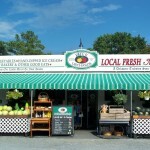 My interest is that their Dewey Beach local market is only about 1 mile from my house. So, there I was, checking it out and how pleasantly surprised I was. The produce looked beautiful; arranged perfectly. But, it is not only produce, it is a whole market. From locally made ice cream with Fifer fruits, to preserves, jams, salsas, Dietz & Watson’s meats, fresh baked breads, sugar free apple butter and nuts. They also carry Lewes Dairy milk and cream. This is the perfect place to visit if you would like to go to the beach and take a picnic. Some of the ready to go salads were: Greek Quinoa, Edamame, Hummus and Guacamole and a Mexican Chicken Salad. Two of their salsas got my attention. The Mucho Spicy Salsa with tomatillos, chilis, cilantro, garlic and kosher salt. And the other was the Some Like It Hot Salsa and it had the same ingredients of the Mucho Spicy one, except that instead of chilis, it had jalapenos. Ay, caliente!! Other products made with Fifer Orchards’ produce were sauces like Thai Peanut, Tequila Chili, Peachy Chipotle and the Peach Grilling Sauce. Spending some time at my beaches and having some people over? Well, do not despair, because they have party trays available for your guests. Just give them notice. For breakfast, at the local market, you will find bagels, muffins, scones and other fresh baked pastries, as well as croissant sandwiches. For lunch, they have salads and Panini-Style sandwiches, and other Deli sandwiches. For dinner, they have Rottiserie Chicken and BBQ Ribs. You may even get fresh cut steaks and fish. Just call to the above telephone and ask for the current selections. While I was visiting this market, everyone was very helpful and most of all friendly. The new breed of Fifers have a legacy to maintain and it looks like they are doing a great job. They should be very proud of this store. Writing about all this food has made me hungry so how about if I add a recipe to this post? Preheat oven to 350 degrees. Spread walnuts on a baking sheet and toast for about 8 minutes. Transfer to a plate to cool, then break in half lengthwise. Toast fennel in a small skillet over moderately high heat until fragrant and golden, about 1 minute. Set aside. Steam asparagus spears over high heat until just tender, about 4 minutes. Transfer to paper towels and let dry. Cool, then cut diagonally into 2″ lengths. Meanwhile, in a large bowl, whisk olive oil with vinegar, scallion, tarragon, mint and fennel seeds. Season with salt and pepper. Add asparagus and walnuts to bowl and toss. Add goat cheese. Adjust seasonings and serve. Always make the recipes your own and enjoy them. This one will serve 6. JavaByte is not just another cafe; it is a full service shipping, mailing and copy service with Mailbiz Express. They are located in the Midway Shopping Center on Coastal Highway, also known as Rt. 1, next to the movie theaters. The tel. is 302-644-8287 and their website is www.mailbiz.javabytecafe.com. The owners of this establishment are Tom and Victoria Kopunek. They are dedicated workers that are there all the time and ready to help you, either by setting you up with their wireless internet service that has a high speed cable modem via their own network, by packaging and shipping anything you need to mail, and by printing all sizes of documents. Private mailaboxes are available, as well. Their hours of operation are Monday to Friday from 8 a.m. to 6 p.m. and on Saturday from 10 a.m. to 4 p.m. I have used them for all types of shipments for years. I do have a son in college and from time to time he needs things shipped. Perfect place to mail your holiday packages. Tom just printed my new business cards for my blog and I am totally pleased with them. I am even having them print some stationery too. Their internet cafe is relaxing, quiet, and they have several computers available. Feeling hungry while working on the computer? Not to worry, since their cafe is ready to provide you with all kinds of coffees and lattes, as well as fresh baked pastries like croissants, scones, gourmet cookies, cakes, fresh pies and Danishes. And for lunch they have grilled Panini sandwiches like a JavaByte Rueben which is a classic Rueben served with marinated artichoke hearts or a Blue Roast Beef which has roast beef, red onions, tomatoes, horseradish sauce, alfalfa sprouts and blue cheese, all served with a side of potato salad or coleslaw or organic grain salad. Besides the Panini sandwiches, they have their Java Wraps and additional specialty sandwiches. A daily quiche and an assortment of salads are available, as well. So, really, you can stay there all day and work on your computer, sit at one of their tables or relax on their sofa while reading the newspaper, eating to your heart’s desire. I cannot believe they even have time to walk their beloved Boxer, Stoli, even though I call him Leningrad. It fits him. All kidding aside, check them out. Sooo, again, until next time. Have a good week-end. The whole park is beautiful with hiking trails, swimming, surfing or just watching its wildlife. The area that I would like to tell you about is the Seaside Nature Center. It is located on 42 Cape Henlopen Drive, in Lewes, Delaware, 19958. The tel. is 302-645-6852. The Center is open from 9:00 a.m. to 4:00 p.m., year-round. They do have extended hours from 9:00 a.m. to 5:00 p.m. from June 15th to September 7th. They have many programs available for just individuals or for the whole family. The children need to have a parent or guardian with them. For more information on specific programs and registration, please call the above mentioned telephone. There are programs available for schools and other groups; so please go to their website www.destateparks.com for a complete list. Some of these programs will need pre-registration. One of the things you can do if you are not able to visit the park is visit www.friendsofcapehenlopen.org/cam. By visiting this website you will be able to enjoy the live Osprey Cam that was donated by the Friends of Cape Henlopen State Park. In order to get to the Nature Center you will need to, actually, go into the park and pay the fee of $4.00 for instate or $8.00 for out of state. At the time of this post, some of these programs will be coming to an end, but if you are at my beaches, you might be able to take advantage of some of them plus you can always visit the Center. It is still as I remembered it, when I used to take my children. Rustic, with just a few updates. Seining the Bay – Until August 29th. 9 – 10:30 a.m. Collecting and learning and getting wet, while learning about the Delaware Bay’s creatures. Maximum of 6 tickets per person. $4.00 per ticket. Beat the Heat – Until August 28th – 2 – 3 p.m. It is an indoor program. It is free of charge but call the Nature Center at the above mentioned telephone to find out what the topic will be. Touch Tank Creature Features – Last day will be August 29th at 3:30 p.m. There will be a naturalist at the touch tank, but you will want to be prepared to touch sharks, horseshoe crabs, or the “critter” of the week. It is free of charge. Volunteer Trail Day – It is the first Saturday of every month from 9:00 a.m. until noon. If you are available, you might be able to help the Friends of Cape Henlopen maintain and improve the many trails of the park. It will include clean-up, minor construction projects, trail maintenance and more. That is why it looks great. So many times, I have encountered people that own a place here, at my beaches, and wonder what they could do if they retired here. I always say that you can do as much or as little as you want to. So, if you like nature and being outdoors, this organization might be a good one to try. At least you will be able to meet other people and help the area. Have fun!! Talking about summer coming to an end has reminded me that some of us with sons and daughters in college wonder if these students are having a well balanced meal. I am sharing this recipe with you because it is so easy and it can be doubled if you so desire. It is also very budget friendly. So, tell your sons and daughters to check this blog and get them cooking. Brown ground beef. Add onions and green pepper while beef is browning. Drain off fat, after browning, but if you buy lean meat, you won’t have to. Put into a casserole. Add rice, chili powder, salt and pepper. Pour can of tomatoes over it, chopping tomatoes into medium pieces. Bake in a 350 degree oven for 1 hour, covered with foil. Note. If you double it then you will have to adjust the cooking time. Just add a salad and you have a meal. Remember, make it your own. Facebook Etiquette….Manners, whether on My Beaches or Online, it is Your Responsibility…Don’t You Think? Before I started blogging, and while I was thinking about the concept for my site, it did not cross my mind that I was going to be on Facebook. I still remember one of my son’s friends saying that nobody over 35 should be on Facebook. No sooner he said that, I came across an article that said that most of the Facebook accounts are held by people way over 35. Surprise, surprise. I think the idea of mature adults being on Facebook is that you can connect with people from your old schools, or other cities or towns you have lived in, or past jobs. Maybe you might think, well, if I have not contacted them then; why should I do it now? There might have been lots of reasons but I can tell you that through Facebook I have reconnected with some of my childhood friends and it is a good feeling. Oh my gosh, I can’t believe that I am even on Twitter now because of the blog. Not too many followers yet, though. Just as I posted last week about etiquette on the beach, Cindi and Debbie, friends from Ocean City, Maryland, mentioned that a post on etiquette should appear on this blog. As I was gathering information, I did not have to look far to tell you that there are so many rules of etiquette on Facebook and other online social networks. If you have an account with Facebook and you scroll down to the bottom of the page, you may hit terms and you will find all kinds of rules to adhere to since you decided to become a Facebook member. I am sure a lot of us have not looked at that information. I also found the following information on 2 websites. Do not put pictures of you without a shirt. Now I don’t think I need to expand on this one, do I? Do not friend random people. And, why would you do that anyway? This is another one. Don’t put a picture of you drinking. Or, when you have had one too many. Probably, the picture will not be a good one, believe me, it won’t be. Don’t talk on your wall about past indiscretions. Everyone can see it. Don’t be so personal, keep it clean. Do not overload on the corny quotes. This is not your high school graduation. Yes, some people really overdo it. A perfect etiquette rule is; easy on the updates, over sharing could be a problem. Every meal eaten, weather conditions, etc. should not be a status update. Ask yourself if anyone really cares about your comments. Limit Facebook chat. Just because you see someone with an open window on Facebook, does not mean they are available to chat. That person might be busy. Again, don’t put pictures of you or anyone, even with their permission, on Facebook if the pictures are unflattering. It is not funny. The same goes for tagging. You may untag yourself it that happens. You are under no obligation to acknowledge a Facebook friend request. Again, just like the beach etiquette, it is just common sense. Until next time, yes, talk to you later. Have a good one!! Comments Off on Facebook Etiquette….Manners, whether on My Beaches or Online, it is Your Responsibility…Don’t You Think? No, I did not know that I was going to end up at Fish On last night. I am glad I did, though. As I looked to the West the sunset was spectacular. It was red and huge and beautiful through the trees. I hope you got a chance to see it, just as the waxing crescent moon, showed this phase on the Delmarva sky. Fish On was quiet on Monday night. Don’t get me wrong, they had customers but it was Monday and usually it is a little more subdued. Good night to go out to dinner during the summer. This restaurant is located on 17300 North Village Main Blvd., Lewes, DE 19958. It is on the corner of North Village Main Blvd. and E. Batten St., in the center of the Villages. Tel. is 302-645-9790 and the website is www.fishon.bz. You should check their site because they have different specials and upcoming events. It is very easy to get to. If you are on Rt. 1 or Coastal Highway, take Rt.9 East, which is also Savannah Rd. and go to the next Light and turn left by the Food Lion and go straight to the back of the Villages and you will see the restaurant on your right. A very contemporary restaurant, indeed it is, with high ceilings and wide open spaces. They are open 7 days a week at 5:00 p.m. The restaurant has a full bar with the ever present televisions. I had not been to Fish On in some time; no particular reason, but the menu looked great. I had the most interesting and refreshing salad, which was their special, and I am glad that, Chris, our waiter suggested it. The salad was a watermelon salad with baby arugula, goat cheese, fresh squeezed lime juice and sea salt and pepper. It was presented as 2 big wedges of the watermelon with the arugula on top and it was big enough for 2 people, but I did eat it all myself. I cannot tell you enough how good it was and perfect on a hot summer night. The combination was a hit. For my dinner I also chose one of their specials; flash fried soft shell crabs on top of arugula with a citrus vinaigrette. Again, it was light, simple, and perfect. My husband had the pan seared scallops with sweet corn, soy beans, cherry tomato succotash. Very tasty too and we had mentioned to Chris that he had a gluten allergy and they were very careful on how his dinner was cooked. For starters – Pan roasted mussels with spicy tomato and chorizo, and mini white fish tacos, as well as fried baby lobster tails, with a chipotle dipping sauce. Salads – Caesar with white anchovies, and they also had grilled asparagus. Mains – Fennel seed crusted tuna, a creamy Cajun penne pasta and a Lewes seafood stew. A la carte you could order roasted garlic spinach, lobster mash potatoes and truffle fried brussel sprouts. Fish On had quite a few desserts too like a caramel toffee cheesecake, apple pie, warm bread pudding with maple banana sauce and a Maine root beer float. A special menu for kids 12 and under was available, as well. After dinner indulgences included Irish Coffee, a Mint Martini, Port, Reverse Port and Tawny Port. “Ports are made of blends of several grape varieties, vineyard lots and vintages.” It is a fortified wine from the northern provinces of Portugal. It is usually sweet but can also be dry and semi-dry. It is an after dinner drink, most of the time. A Port that is too dry is a Reverse. Tawny Ports are wines that are made from red grapes. They have been aged in barrels made out of wood and they have been exposed to oxidation and evaporation. Because of this, they slowly turn to a golden brown color. And, because they have exposure to wood, it gives a “nutty” flavor to the wine. They are sweet or medium dry. If no age has been given, then it has spent at least 7 years in barrels. So, if you live in the Lewes, Rehoboth and Dewey Beach areas or are visiting my beaches, try Fish On. Let me know how you like it. I would like to hear what you have to say on the reviews because this is my personal opinion and we all have different tastes. Oh, I almost forgot to let you know that Fish On has a patio where you can have dinner, weather permitting, and you are most welcomed to bring your pooch for a night out. Lewes Summer Music Schedule is held at the Stango Park, 110 Adams St., behind the Lewes Library. Free of charge from 7:00 – 10:00 p.m. Just remember to bring a chair and bug spray. Saturday, August 29th – The Children’s Beach House Barbecue at the Children’s Beach House on 1800 Bay Ave., Lewes, DE 19958. Tel 302-645-9184 or 302-655-4288. Individual tickets will be $85 but go on their website for more information www.cbhinc.org or e-mail inquiry@cbhinc.org This fundraising event is for their Sandcastle Program and it starts at 6:30 p.m. until 9:00 p.m. In the early 1930’s Lydia Chichester duPont founded this organization and its mission is to provide children with special needs the healing qualities the coastal environment has to offer. For this particular fundraising event one of a kind shaker tables painted by local artists and sponsored by various businesses will be auctioned. They are gorgeous and you can see them on the above mentioned website. Monday, August 24th – Tonight’s movie will be Beverly Hills Chihuahua at 8:30 p.m. (dusk) on Dagsworthy Beach. Check the lifeguard stand station on Dagsworthy St. in case of bad weather. Bring a chair and your family. Exercise Classes – Monday, Thursday, Friday and Saturday. Drop in. $6.00 per class. Time is 7:30 a.m. until 8:30 a.m. Call 302-537-7838 for more information. Thursday, August 27th – at 7:00 p.m. First State Ballet Theatre. It is free of charge. Friday, August, 28th – From 7:00 p.m. until 9:00 p.m. is Tommy Edward as Sir Rod Stewart – A Rod Stewart tribute. Saturday, August 29th – 10:00 a.m. – 11:00 a.m. is Chocolate Covered Fairytales by Gary Lloyd. Storyteller for kids of all ages. Thursday, August 27th is the Bonfire Hour at North Division St. with a different speaker every time. The time is 9:00 p.m. but for more information go to www.oceancity.com or call them at 800-626-2326. I am totally exhausted. Today, Sunday, I went to the Convention Center in Rehoboth Beach, where a huge auction took place. That was a full day event. Emmert Auction Associates is a family operated enterprise. Butch Emmert started the business 34 years ago and the whole family is involved. Their telephones are 302-227-2433 during the day, 302-227-2714 in the evening and fax is 302-227-3946. Their e-mail address is emmertauctions@aol.com. The website is www.emmertauction.com and you should go on it if you would like to find out all the upcoming auctions held by them in the Delmarva Peninsula, plus all kinds of pertinent information. I have been to auctions for school fundraising events and I have actually stopped by at one of the Emmert auctions, but I had not stayed the whole day. This particular auction had everything you could imagine. From a huge collection of guns to cars, Delaware tags (that will be another post, another time), plates, bikes, jewelry, furniture and even a Capano Trial Original Art. Hmm, I really don’t know who bought that one. They had rare maps, Canton China, rugs, and miscellaneous knick knacks. It was crowded because the perfect day for an auctioneer is to have a cloudly day in my beach town. What else are people going to do? There were a lot of locals and natives in attendance. Probably, these are the people that know what they are looking for and where to find it. It was very interesting. The art was in abundance but 2 pieces were of particular interest. There was an Alexander Charles Stewart Marine Scene. In case you don’t know who he is, he was born in Scotland and became a painter of ship portraits. After 1866 he spent the rest of his life along the Delaware River. He is considered one of the most prominent painters of that genre. The other piece of art was a watercolor by Howard Schroeder. His paintings are coveted by all, but mainly by natives from the Delmarva Peninsula. In his paintings, he recorded the changing life of Southern Delaware for 50 years. I left before the car auction and the Delaware tag auction had started. I am sure they were eye-catching. Emmert auctions are year-round, so if you have never been to one or you are looking for something special or even if you would like to get rid of a few things or a whole estate, please get in touch with them. I am sure they would love to talk to you too.